We had come too far. There was no turning back for groceries OR food. What happens next? We challenged ourselves to cook what we had on hand. You know, it’s really amazing how much “stuff” we just have and don’t think to cook everyday. We typically stick to our normal round of eight tried and true recipes and supplement with take out. This portion of our blog is to really try to step out of that boxed in life and experiment a little bit. Here’s our first of I’m hoping a string of successful #DateNightInKitchenChallenges . (Check out the hashtag on “the gram”…ew, I hate myself for saying that, but Look ‘Ma! We created a hashtag challenge!) Play along with us and have a date night in with your: boo, sweet thang, pumpkin head, schmoopsy poo, or heck even make it a fun family dinner night on a Friday with a family game night to follow (those were my favorite growing up)! Either way, get in the kitchen and make meals fun again! On to what the sides should be! As my awesome Instagram followers may have the tiniest hunch about, I may or may not have an unhealthy appreciation for cheese…and carbs…but mostly cheese. It IS NOT unusual in our house to have four or five sliced cheese packages (havarti and sharp cheddar are staples), 5lb bag(s) of shredded cheese, fresh mozzarella, Parmesan (both the good kind AND the famous green can kind…just to keep people on their toes about us), cheese sticks, and the occasional/rare brie if it even makes it to becoming a leftover. Hmmmm, maybe a chicken, spinach, ricotta, casserole type thing? Tasty! But no…not feeling a casserole. Stuffed Shells?! YES!! Wait…no…we don’t have the shells. Back to the fridge…wait a minute, something’s coming to me. Deep in the depths of my Pinterest cataloged mind I remembered seeing a pin about wonton‘s in place of…noodle noodles. We had the wonton wrappers!!! We combined about 3/4 container of ricotta cheese (whatever was leftover) and one defrosted and drained (wring it out!!) package of frozen spinach. Most recipes don’t call for seasoning this, but I just can’t not season it. I put a HEAVY pinch of garlic powder…like probably more like 2 tsps of it. I threw a bit of salt, pepper, ground onion, basil, parsley, oregano and a touch of cayenne and mixed, mixed, mixed! For the “papooses”, we cut the wonton wrappers in half, added about half a teaspoon to the wonton, wet our finger in water and “painted” a water seal on one side, folded it ontop of itself, pinched out the air and sealed the edges with our fingers. I kind of forgot to tell Neil that you really shouldn’t over stuff these because they become a sort of mess while cooking…oh well, live and learn it was still fun and OH SO GOOD! The Tillamook Cheese Sauce was an impulse buy for me when I went grocery shopping last week. I had planned on making either a casserole to send back to work with Neil in Dallas or making a gnarly mac and cheese with it for Kaya and I to devour this week. I think we put it to MUCH better use here…although, I’ll probably buy it again to figure out that mac and cheese…at LEAST. So, it’s like stupid easy to throw together. I knew I didn’t want a thick and goopy cheese sauce like you’d find with macaroni and cheese, I wanted something thinner that we could still taste the ravioli ingredients AND wouldn’t drown the chicken out. I ended up adding about two cups of milk instead of the suggested one cup and that worked perfectly. You add the bag of cheese that’s included with the mix and a sauce packet. We added more garlic powder…because it’s required of every recipe, obviously. By this time, Neil needed to get the grill ready. He’s not usually the first to volunteer for grilling chicken, ever. This may have been the third or fourth time in the seven years we’ve been together that he himself has grilled chicken, which makes me so sad because I love it so! He really does make it juicy and delish every time (hint, hint babe…)! Ok, coals are “goin”! He puts the chicken on and grills it up about 5-6 minutes per side. The coals are still rolling…he yells from outside for me to bring him something else to grill so he doesn’t waste the coals! I start swinging open the fridge to check out what else we had!? Ew. Corn’s gone bad…to the goats! HOLY MOTHER!!! We struck gold! We have asparagus! Wait…neither one of us has ever grilled asparagus before. Steamed, hell yes. Roasted, done and done. Grilled…noooope. Oh well, we can eyeball it. We throw the asparagus on and seasoned it with lemon pepper on the grill (lol that was the best smelling smoke ever! I don’t think anything actually stayed on the asparagus) After (un)intentionally charring the hell out of the asparagus, we decide to roll with it. Back in the kitchen, we’ve got a salted pot of water starting to boil for our wonton ravioli to be tossed in. Next time we’re going to try pan frying these instead. It wasn’t BAD this way, but I think we’d have a stronger flavor that we were looking for if we fried it! 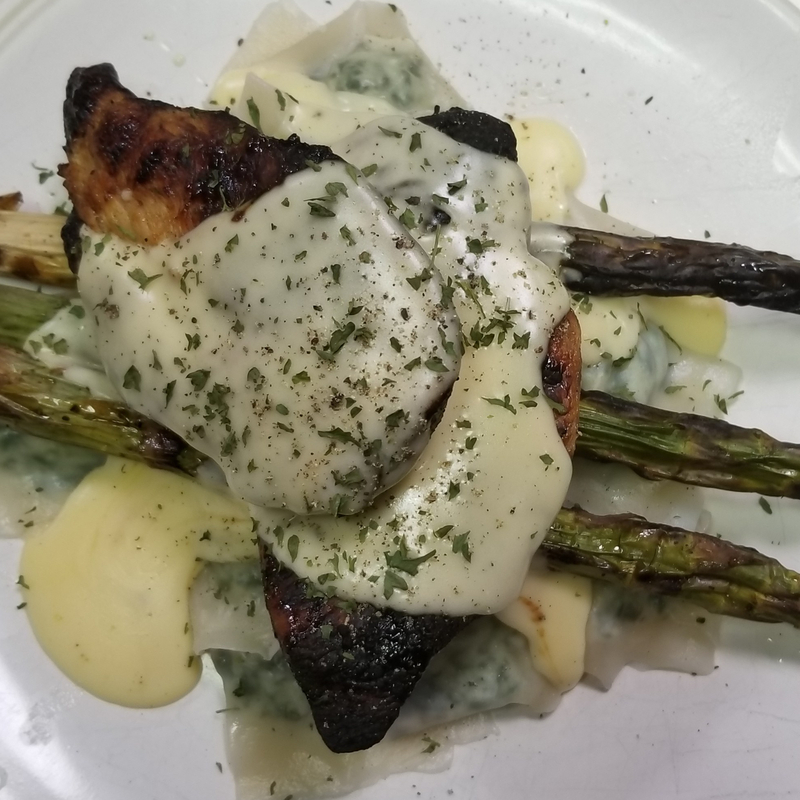 I added a few of our charred asparagus shoots on top of the ravioli, the chicken breast and topped it with the cheese sauce. Throw a little parsley on top (because we’re fancy) and you’ve got yourself a damn good meal. Defrost spinach! Squeeze out every last drop of water that you can! Place asparagus on grill for 2-3 minutes…watch them…we left them on for like 10 minutes, they were still good…but let’s just say “husk” comes to mind. Start a large salted pot of water to boil for wontons. Cut wonton wrappers in half. Spoon out half a teaspoon onto one half of the wonton wrapper. Wet the edges of the wonton on the side the filling was placed. Fold over the top and seal the edges by squeezing with your fingers. Set aside the stuffed pasta. Once the water is boiling, throw in a handful of the pockets. When they float to the top, they’re ready to come out! Plate the ravioli, asparagus and chicken, smother in sauce (and come back for more) garnish with parsley and EAT UP! Parting Thoughts on the recipe. While it was definitely not perfect and will require some tweaking, this was SUCH a fun date night in with my guy. I encourage you ALL to do something fun and unexpected every week to keep the romance alive and really keep that conversation flowing! Next time I think we’ll sub out asparagus for roasted broccoli, pan fry the ravioli and use a brown butter lemon garlic sauce or try Tillamook’s Alfredo sauce starter….who know’s if it’ll work but that’s the fun part! !